A competition to find the best automated coin classification algorithm, with a prize sponsored by the MUSCLE Network of Excellence, was organised in 2006. The training and test images for the competition are from the Coin Images Seibersdorf (CIS) database, created as a result of the changeover from 12 European currencies to the Euro (see link to related article at left). The results were presented at a workshop held in September 2006 at the Heinrich Hertz Institute in Berlin in conjunction with the 28th Annual Symposium of the German Association for Pattern Recognition (DAGM). The training data provided to the participants consists of 30000 coins, corresponding to 60000 images (as the front and back of each coin is imaged). These are divided into 692 coin classes with 2270 different coin face classes. There are more coin face classes than coin classes, as some coins changed their appearance over time, when new coin series were issued or designs to mark special occasions were introduced. Rather inaccurate measurements of the diameter and thickness of each coin made by light sensors were also provided. The task of each participant in the competition was to write a coin classification program and submit it to the organisers. Each program was then run on an unreleased competition dataset consisting of 10000 coins. Coins belonging to 362 of the 692 coin classes in the training data were present in the competition dataset as well as 242 coins not belonging to any of these classes. The latter were to be classified as unknown. To simulate the demand by the national banks that only 1 in 10000 coins be classified incorrectly, an incorrect classification was penalised more heavily than a classification into the class of unknown coins. MUSCLE is a European Network of Excellence that aims at fostering close collaboration between research groups in multimedia data-mining on the one hand and machine learning on the other (http://www.muscle-noe.org/). Marco Reisert (centre) receives the prize from competition organisers Michael Nölle (left) and Allan Hanbury (right) (source: Fraunhofer IPK Berlin). end. Two of these ran correctly on the competition data. 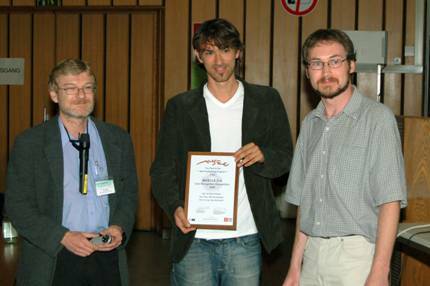 The prize of €1500 for the best performing coin classification program went to Marco Reisert, Olaf Ronneberger and Hans Burkhardt Chair of Pattern Recognition and Image Processing, at the University of Freiburg )Germany). Their program classified 9724 of the 10000 coins correctly and no coins incorrectly (all others were classified as unknown). Their algorithm computes the similarity of two coins by the use of registration techniques. The coins are first segmented by a kind of Generalised Hough Transform. Only the directions of the edge gradient vectors are then extracted. Two coins are aligned by looking for the orientation at which the largest number of corresponding gradient vectors point in the same direction. The classification is done by a nearest neighbour search. A full description of this algorithm is in the workshop proceedings, which can be downloaded from the coin competition webpage (muscle.prip.tuwien.ac.at/coin_proceedings_2006.php). The training dataset, competition dataset, and detailed classification results of each submitted algorithm are also available on this page. A second MUSCLE CIS Coin Competition is planned to take place in 2007. The details can be found on the coin competition webpage (muscle.prip.tuwien.ac.at/2007_CIS_Benchmark_Competition_Flyer.pdf).